Here they come, my three favorite recipes to take to work or on travels. Colleagues would often be amazed at my food and say something like “Ohhh that looks yummy! Did you make that yourself?” And then followed by – mind you without me responding – an excuse like “I certainly don’t have the time”/ “that surely is way too elaborate”/ “I’m just not talented” and so on. As if! At the latest with this blog post there are no more excuses! If you want to eat healthy on the go or at work, you can do so with these simple recipes, which only need just a little attention or time for preparation. I often double the servings at night and therefore don’t need to worry about my lunch for the next day, while at the same time I can even get other things done as well. Also, if you have other mouths to feed, you can easily double or multiply these three recipes as often as you want. Since these 3 meals taste a tiny bit better when eaten warm, I’d recommend them when you have the possibility to reheat them. If you’d rather like something cold for on the go, check out this recipe collection of healthy meals for on the go. By sharing my favorite go-tos, I hope everyone will find a few convenient recipes for themselves, which one can always fall back on, especially when lacking in creativity or time. I consciously assembled these meals without any frills. So depending on where in the world you are reading this, you should find all of the ingredients at most grocery stores. Actually those are the ingredients I (and probably you) usually have at home anyway – at least most of the time. And even if you need to get some of the ingredients, I made sure they would overlap within the individual recipes. 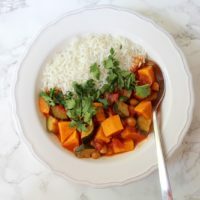 This sweet potato curry is tangy, warming, keeps you full for longer and tastes extremely delicious. It’s also absolutely foolproof and only a few steps are necessary. This curry also makes a great vegan counterpart to chili con carne if you want to serve both, vegans/ vegetarians and meat eaters at parties. Okay, there’s one ingredient that we need to talk about: miso. I know, I know, a few paragraphs above I wrote how you’d find everything at the grocery store. And indeed, miso is available at some conventional stores these days, definitely not everywhere though. But there are two very good reasons to use the condiment paste of fermented soy beans. Okay actually there are three good reasons: 1. It tastes really good. 2. It is very versatile and has a very long shelf life. With miso you can substitute vegetable broth, cultivate sauces/ curries and soups and it adds this indescribable umami taste. 3. It’s very healthy. Despite those what I’d consider to be extremely good reasons to be getting miso, I thought of an alternative, which you can find in the recipe notes. 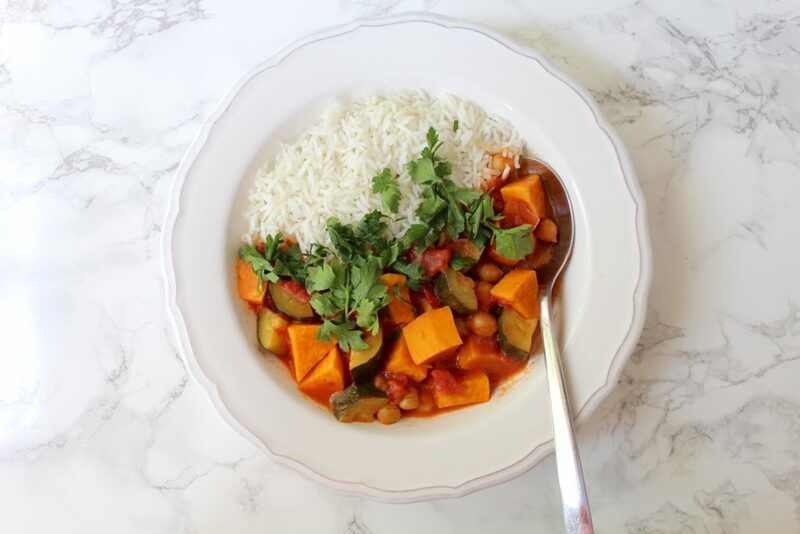 This sweet potato curry is tangy, warming, keeps you full for longer and tastes extremely delicious. It's also absolutely foolproof and only a few steps are necessary. This curry also makes a great vegan counterpart to chili con carne if you want to serve both, vegans/ vegetarians and meat eaters at parties. To a pot add coconut milk, tomatoes and grated ginger. Warm over medium heat. Cut sweet potato and zucchini into bite sized pieces add to the pot, along with the chili. Close pot with a lid and let simmer for about 25 minutes over low-medium heat. Mix together miso paste with 1 tbsp water in a bowl. Combine chickpeas with the miso and add to the curry. Allow to simmer for another 5-10 minutes over low heat. Top with parsley and serve with rice, bread or just as is. Of course you can substitute fresh tomatoes for the canned ones. However, canned tomatoes are not only convenient but they're also full of flavor, as they're picked at their ripest. A pretty good reason for using them primarily in sauces (even top chefs will do). I'd just make sure that the cans don't contain any unnecessary additives. If using fresh tomatoes, I'd recommend peeling them and adding a dollop tomato paste. Instead of chickpeas, you could also use peas (e.g. frozen) or any other cooked beans. It's hard to substitute miso. However, this recipe should be a good alternative: 1/2 tbsp tahini (sesame paste), 1/2 tsp soy sauce/ tamari and 1/2 tsp maple syrup (or other liquid sweetener). You can freeze this curry and it will also keep well in the fridge for several days. I like to double the recipe to simplify (e.g. dish washing). Since the miso (and also the soy sauce, if using) is pretty salty already, I usually don't add any extra salt to the curry. Depending on what you use, you may want to season to taste at the end. 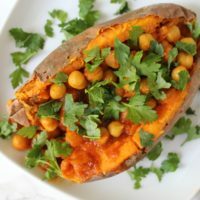 The combination of sweet potato and spicy chickpeas is just so good, I enjoy it several times a week. I usually have both at home at all times anyway. Another great advantage with this recipe is that I don’t have to spend a lot of time cooking, when I just don’t have the time. 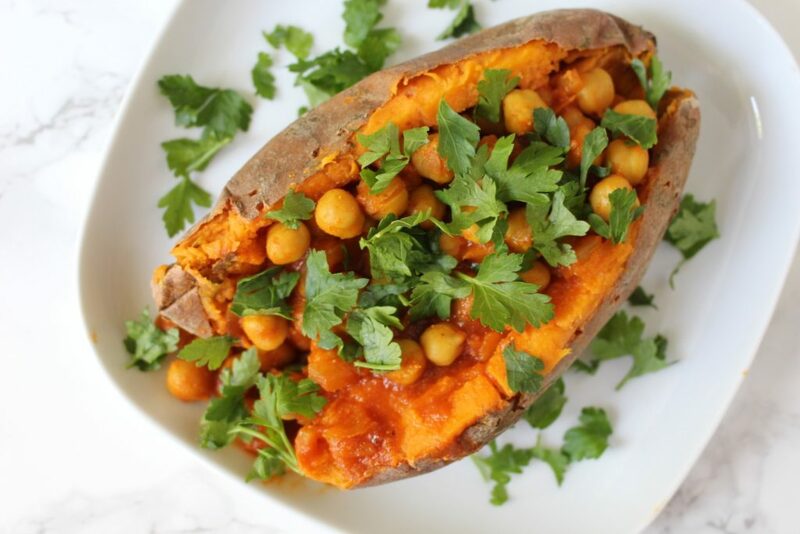 Whenever I take this stuffed sweet potato with me, I pack the potato and the chickpea curry separately and then reheat all together in the oven (at work). This is one of my favorite recipes ever. I always go back to it whenever I want something hearty without having to spend a lot of time cooking. Wash sweet potatoes, poke them with a fork a few times and place onto an oven rack (on top of some parchment paper). Bake for about 45 minutes or until tender. In a small pan, sauté onion, garlic and ginger in some water (or oil). Add tomato paste, curry, chili and finally chickpeas while stirring and let cook for 1-2 minutes. Deglaze with 1/2 cup (about 120 ml) water, cover and let simmer over low heat. Stir regularly and remove from stove when all the liquid has evaporated. Depending if the chickpeas were salted already, season to taste. Cover and set aside until sweet potatoes are ready. Take sweet potatoes out of the oven and let cool until cool enough to handle. Cut lengthways and break up with a fork a little (if prepping for later, see notes). Arrange chickpea curry, top with some parsley and serve right away. If not serving right away, don't cut but instead store/ pack separately. Once ready to eat, either reheat individually or, a lot simpler: cut, fill and reheat all together. Potatoes and lentils both may not sound very tempting, when you include the right spices and make a great dressing, potatoes and lentils can be amazingly delicious though. Mountain lentils are perfect for this recipe since they stay firm to the bite after cooking. Be sure to pack the dressing separately to go! Potatoes and lentils both may not sound very tempting, when you the right spices and make a great dressing potatoes and lentils can be amazing. Mountain lentils are perfect for this recipe since they stay firm to the bite after cooking. Sauté shallot in a small pot with a little water (or oil). Add lentils, turmeric and curry and sauté for a minute. Deglaze with 3/4 cup water (200 ml; see notes), bring to a boil and let simmer for about 30 minutes over low heat, stirring occasionally. Cut potatoes in halves (or divide in quarters, depending on size) and steam (or cook in water) until fork tender. For the dressing, combine all the ingredients and set aside. 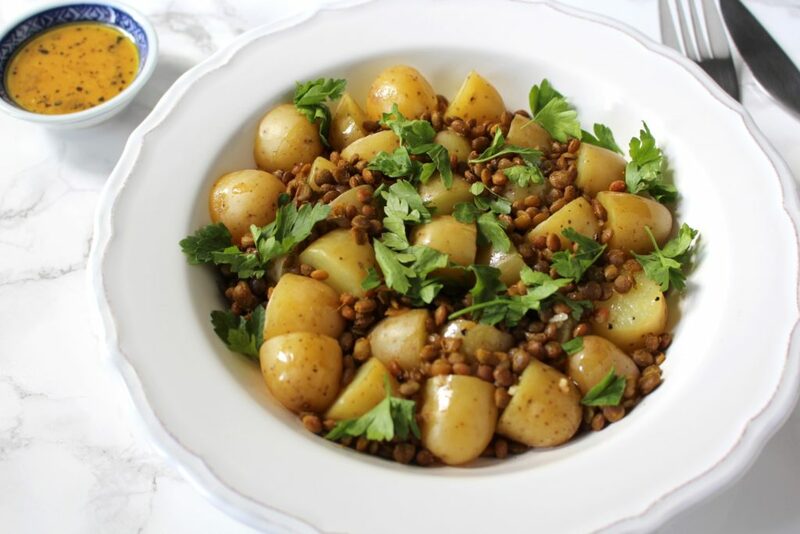 Serve potatoes and lentils warm with fresh parsley and some dressing. You could also cook the lentils in vegetable stock. I like to add about 1/2 tsp miso to the cooking water. If you do use either, be sure not to add too much extra salt though. For take away: pack dressing separately. Reheat right before serving and only then add the dressing (and parsley). It does also taste good cold, though.